Daina Michelle Griffith (foreground), with (from left to right) Alan Bomar Jones, Tony Bingham, Virginia Wall Gruenert, Linda Haston and Susie McGregor-Laine in Well, at Off the Wall Productions. No one's ever going to accuse Lisa Kron of stinting on ideas in her 2006 Broadway play Well, now at Off the Wall Productions. 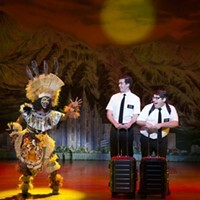 A mainstay of downtown New York theater, Kron's crafted much of her work from her family's backstory, which she does with Well ... plus a whole lot more. Here we're introduced to Ann Kron, Lisa's mother, a progressive activist in the '60s who also spent most of her life ill and almost incapacitated. How Lisa and, by extension, healthy people feel about the ill is a big chunk of Well. But Ann's activism involved desegregation, so there's also discussion about America's racial politics. But mostly, Well is about Well. Lisa is writing the play as she and her company are performing it. There's a lot going on and, speaking as a recovering playwright, I know it can be rough trying to keep everything together. 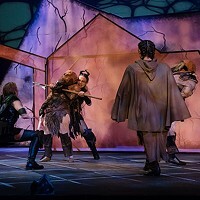 Which becomes another plot point: The piece spins out of Kron's control, with the actors breaking character and refusing to go on until the playwright finds some cohesion. The great thing is that all of what Kron has written is terrific; it's a funny, clever, theatrical mash-up of ideas and issues. Does it work as a play? I don't think so; there's too much going on which is (purposefully) unresolved. But there's not a second you'd rather be watching anything else. Melissa Hill Grande brings a passionate and precise direction to the production. It's not her fault exactly that the event feels so unstructured ... because structure is the last thing on Kron's agenda. The sheer volume of talent in the four-person supporting cast of Tony Bingham, Linda Haston, Alan Bomar Jones and Susie McGregor-Laine is so great you're constantly wishing they had more to do. Virginia Wall Gruenert's miraculous performance as Ann is as amazing as it is because it's all happening in miniature — crafted from sidelong glances, barely audible sighs and slight tremors of emotion. And Daina Michelle Griffith is luminous as the wounded, loving and all-too-human daughter Lisa, trying to make sense of own her life. Griffith does a remarkable job making her journey through the play our journey as well.